Why Choose Alston for Your Luxury Smart Phone? Passionate about your luxury smart phone? Then why settle for a run-of-the-mill case? Alston Craig has a solution to fit right in with your superior taste. One may have decided to snap up the latest iPhone 6 & iPhone 6 Plus, which is thin, light, and made of precision machined metal and glass. Why slap any old case on it? Doesn't the art that is the iPhone deserve a better solution? Judging from the loathsome silicone bricks that often adorn brand new iPhones around town, you would assume that somehow style and taste has gone completely out of fashion. 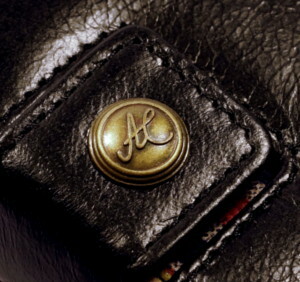 Alston Craig is a rejection of conventional cheap cases as well as a clear stylistic departure from the industry-mandated (and often quite stuffy) drab luxury leather items which do more to fit in rather than stand out. Perhaps you've discovered the flexibility and customization of Google's Android OS, and with HTC's recent line of HTC One machined-metal smart phones, there is finally an Android option fit to compete with the build-quality of the iPhone. 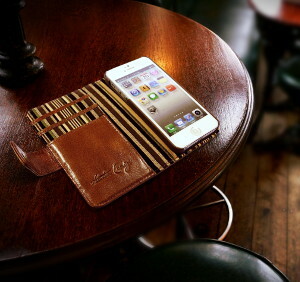 Alston Craig is as much a celebration of style as it is a protective accessory to keep your phone looking its best. 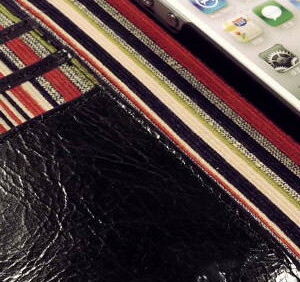 With genuine vintage leather, and stylish pinstripe interior materials, Alston Craig cases are designed to turn heads. Unboxing a phone brand-new top-of-the-line smartphone is a savory experience. And of course there is also that tinge of paranoia involved with using a pristine unscratched handset; a feeling of fragile perfection. To preserve your untainted new device, we are proud to carry Alston Craig cases, which arrive in a gorgeously wrapped silk-black box, with precision trim and logo, inlaid with gold-foil. Be sure to peruse our reviews to see what other luxury connoisseurs are saying about our Alston Craig phone cases and wallets.